Yash Raj Films has acquired the rights of the book written by Brad Cohen, who has Tourette syndrome. Rani Mukerji at the trailer launch of 'Hichki'. 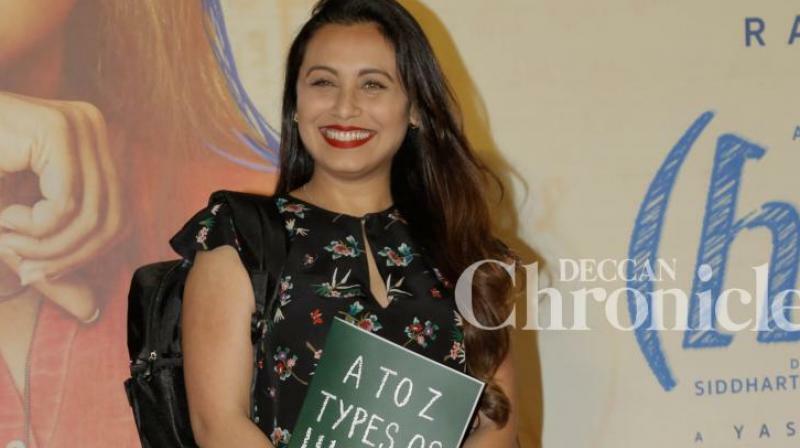 The trailer of Rani Mukerji’s next, Hichki, that celebrates self-belief, resilience of human spirit and the power to chase one’s dreams, has become a rage online. Audiences and fans are loving Rani’s outstanding return to cinema after three years with a heartfelt, power-packed performance. Rani plays the role of Naina Mathur who has a nervous system disorder, Tourette Syndrome that forces an individual to make involuntary repetitive movements or sounds. Hichki is based on the outstanding autobiography by Brad Cohen titled Front of the Class that went on to become an acclaimed Hallmark TV film in 2008. The film was directed by Peter Werner. Hichki focusses on turning disadvantages into opportunities and staring down at challenges life throws at one and ultimately winning over them. The trailer of the film has been attached to the most awaited action entertainer of this year, Tiger Zinda Hai. YRF’s Hichki has been directed by Siddharth P. Malhotra and has been produced by Maneesh Sharma. The film is set to release on February 23, next year. ■Rani Mukerji's Hichki vs James Wolk Front of the Class - Spot the similarities!